If you have never cooked tofu, this is the recipe for you. And if you love cooking tofu, this is also the recipe for you! This dish is packed with flavor. Salty soy sauce, garlic, sesame and a little sweetness all wrapped up in crunchy romaine leaves. 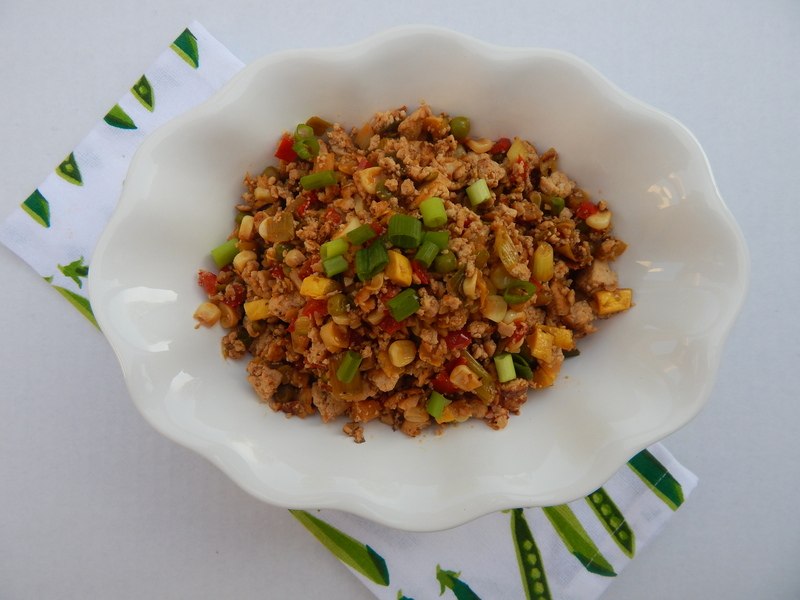 This is a fun dish to make and a great way to use left over veggies. The texture of this tofu is awesome! With just a few of simple steps the tofu develops crispy edges and soaks up the sauce. If you think you don’t like tofu, please try it this way. 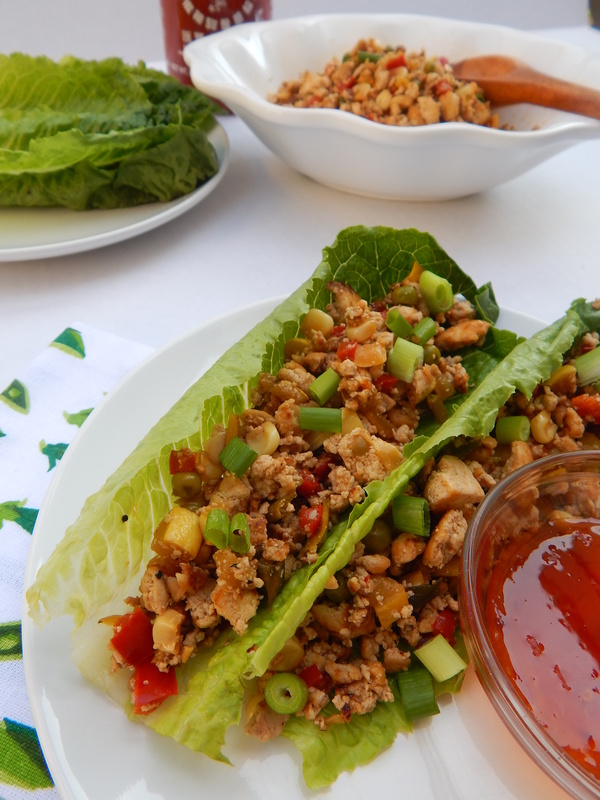 These lettuce wraps are healthy and super satisfying. They even keep my steak loving husband wanting more. I mean, I rest my case. So, I can watch Food Network pretty much all day. It’s my guilty pleasure except I don’t feel guilty about it, so I guess it’s just my pleasure. Umm, that sounds weird, but you know what I mean. I love it, okay? I never get tired of it! One of my favorite Food Network stars is Ree Drummond AKA the Pioneer Woman. 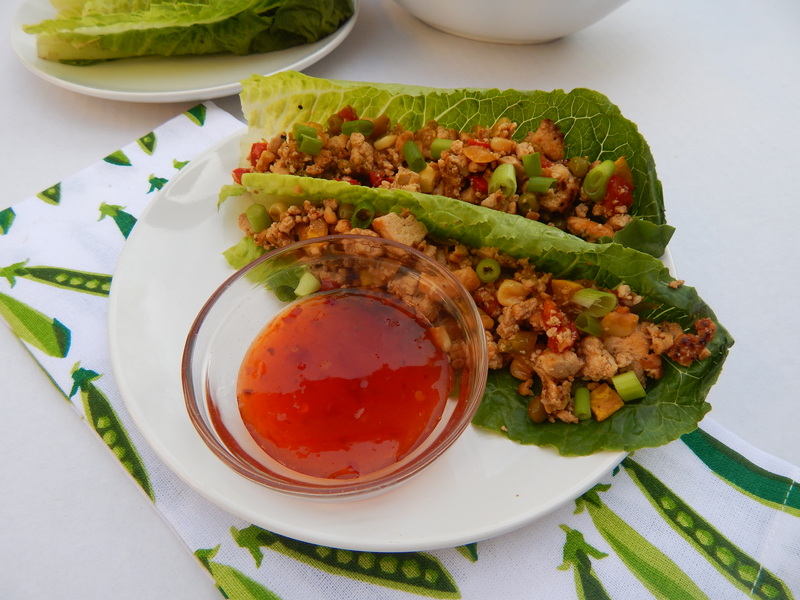 This dish was inspired from having chicken lettuce wraps at restaurants, but also from her recipe for Vegetarian Lettuce Wraps. She makes everything look so good, and every time I have tried one of her recipes it has been a winner. I changed it up and made it my own. You can make this recipe your own as well. Use whatever veggies you have at home, and play around with the sauce. Since I love making tofu, I am always looking for new ways to cook it. One of the techniques I kept coming across was “pressing” the tofu. I had been cooking tofu for years and never knew about this. People use a little square kitchen gadget that is actually made for pressing tofu, but I don’t have one so I improvise. Above is my step by step method. Pressing the tofu is important because it helps get a lot of moisture out of it. The more moisture you get out of the tofu the better texture you can get when you cook it. You can get your veggies ready and make the sauce while the tofu is being pressed. 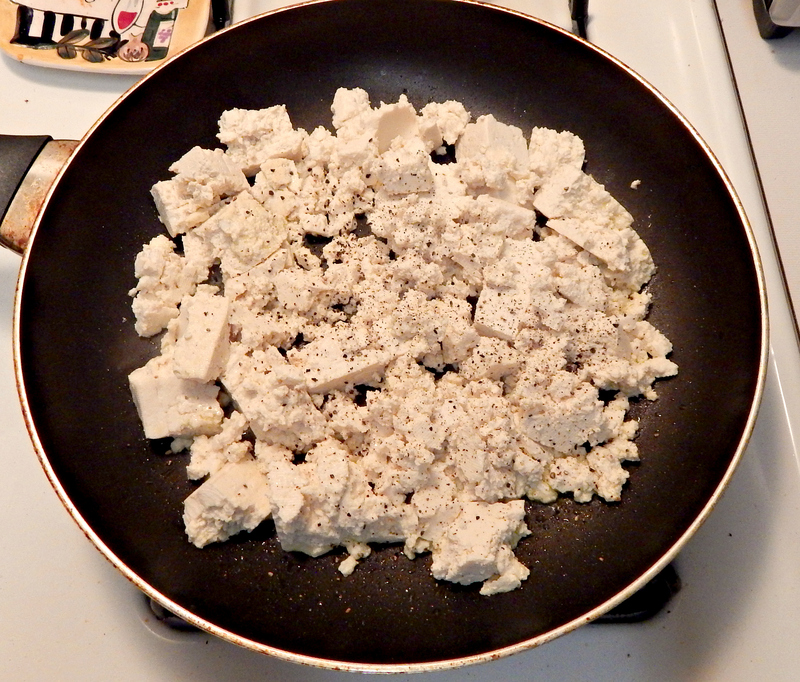 Once the tofu is pressed add a little olive oil to a non-stick pan and crumble in the tofu. Season with salt and pepper to taste over high heat for 10-12 minutes. You want to stir it around and break it apart every few minutes. The tofu is already cooked so all you are doing is browning it up and cooking out some of the moisture. Cook until you develop golden brown color all over the tofu and deep brown color on some of the edges as well. 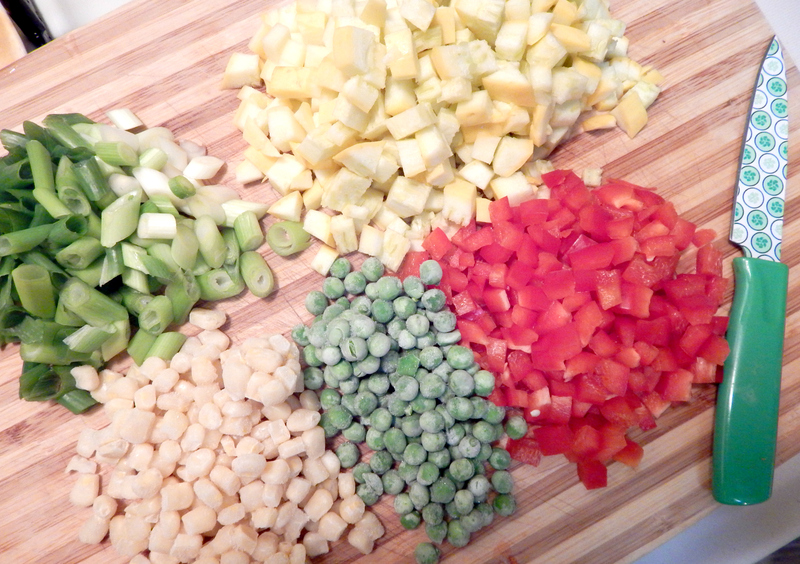 These are the veggies I used: yellow squash, red bell pepper, green onions (all cut into a small dice) and frozen green peas and corn. Once the tofu is cooked I remove it from the pan. In the same pan, saute the bell pepper and squash first because they take a little longer to cook. Then add the remaining veggies. Cook for a couple of minutes longer and lastly add in the tofu and sauce. Let it all cook together for a couple of minutes and its all done! Mmmm… so good. Also, aren’t those green pea napkins the cutest? They are from Target. 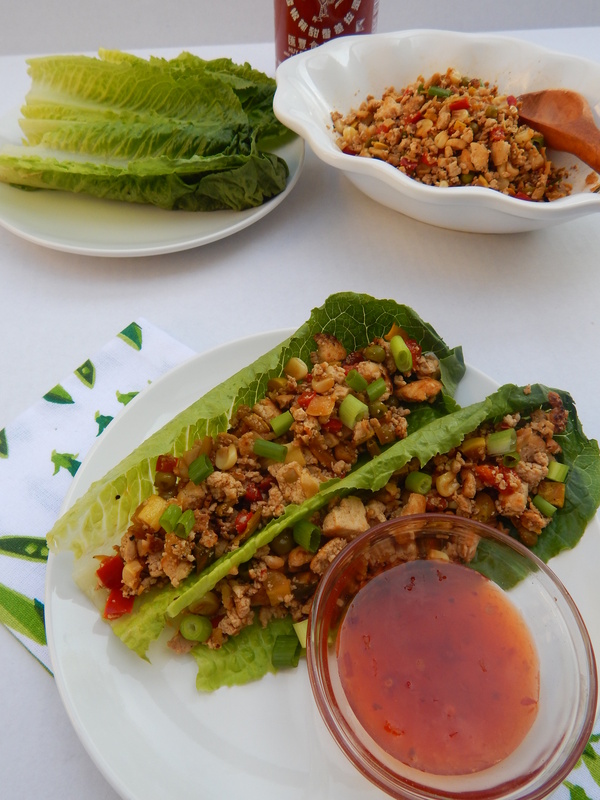 Scoop your filling into crunchy romaine lettuce leaves and serve with sweet chili sauce for dipping. I top my wraps with extra Sriracha hot sauce, surprise surprise. Optional: Jarred Sweet Chili Sauce for dipping. 1. 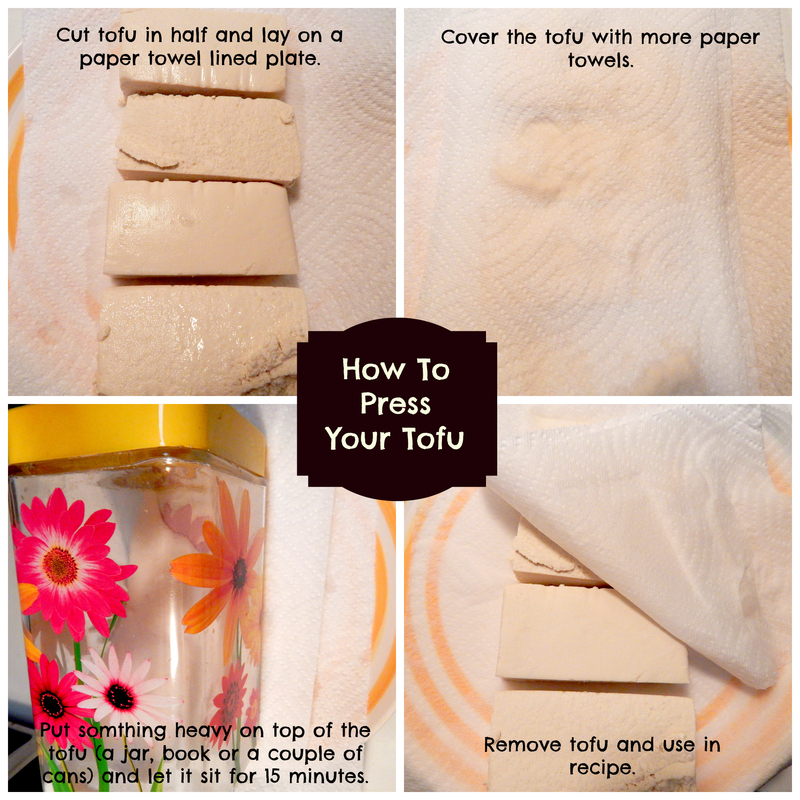 Press the tofu: Cut tofu blocks in half and place on paper towel lined plate. Cover tofu with more paper towel and place something heavy (cans, jar, pan) on top. let it sit for at least 15 minutes or up to an hour. 2. While the tofu is being pressed chop all veggies and make the sauce. Set aside. 3. Heat a large pan to medium high heat, add 1 tablespoon olive oil and crumble in the tofu. Add salt and pepper to taste and cook stirring every few minutes to break up the big chunks. Cook 10-12 minutes or until the tofu has developed golden brown color all over. During the last 2 minutes of cooking add in 3-4 tablespoons of the sauce and let the tofu absorb it. Remove the tofu from the pan. 4. Lower heat on the same pan to medium and add bell pepper, squash and a pinch of salt. Cook 4-5 minutes stirring occasionally. Add the remaining veggies and cook 2-3 minutes. Lastly, add in the tofu and sauce and stir combining all ingredients. Let it cook another 2-3 minutes. 5. Serve hot or warm in romaine lettuce leaves. Dip into sweet chili sauce if desired. Enjoy! 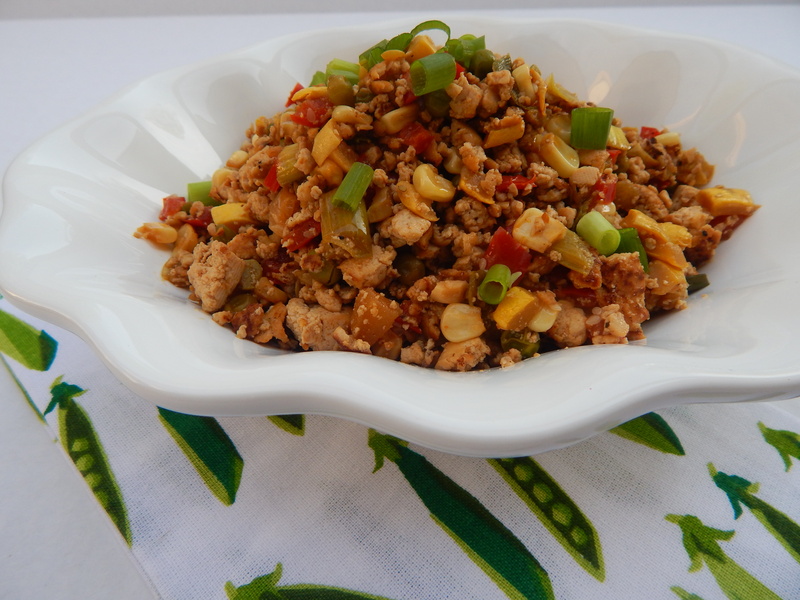 This can be served as an appetizer or alongside white or brown rice as a lunch or dinner. Iceberg or butter lettuce would also work well in this recipe. These look so good. I can’t wait to try them. My sister in law and my youngest niece are vegetarians, so this would be perfect for them.